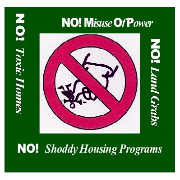 Put the Power in the hands of the people; & Expose practices that potentially cause people to lose their homes and/or real property. Our Plan: Share Our Stories; Demand Accountability of our public officials; Call out any Misuse Of Power; & Demand that Civil Liberties supercede special interests. ALMA has interviewed a number of individuals and families who have shared common grievances regarding the City's abuse of fiduciary duty with regard to Federally and Locally Funded Housing Programs. These people's grievances share a common theme suggestive of a pattern of practice involving apparent abuse of fiduciary duty, mis/mal/nonfeasance; and questions involving the City of Austin's accounting of its federal grant & local bond money. Deposition testimony by City officials and expert witnesses raise other red flag questions: Was/IS the Health and Safety of these people (and more) endangered as a result of the City's and its vendor's practices? Did City of Austin, as a matter of practice, sign for payment (w/ federal funds) for work not done? ALMA has raised other serious questions involving possible fraud and forgery regarding the City of Austin's accounting and record keeping practices. In spite of these worthy questions, our top municipal officials will not explain, nor will they refer these questions of possible criminal violations to the appropriate authorities for investigation! Health & Safety: The Health and Safety of a number of unsuspecting individuals & families may have been jeopardized. These people have a right to know. Marginalization of Lives and Livelihoods: abuse of fiduciary duty & lack of public official accountability undermine economic sustainability for citizens. Broad-Spectrum corrosion of any public department & agenda item: The refusal by Public Officials to enforce/restore Public Official Accountability to any department regarding any violation of law or denial of due process, translates to a general abduction of the Public's Voice and Civil Liberties across the board. When it becomes a matter of practice, no department or agenda is immune. Therefore all residents of Austin/Travis County are susceptible to its adverse consequences unless accountability of our public officials is restored. Cost to Taxpayers / Public Deficit: Deficit Reduction starts by cutting corruption. Let's Cut corruption instead of Human Services! A.L.M.A. strives to unite and amplify the stories of people who share a common concern about abuse of power. Abuse of Power undermines Social Justice efforts; targets and marginalizes certain people; and drains the Public Treasury. Have certain Public Officials (elected or appointed) exercised arbitrary and capricious actions as a systemic 'business-as-usual' practice, to the detriment of the Public's Civil Liberties? Specifically, with regard to the Texas Real Estate Industry, has this compromised the solvency of Small Businesses (i.e. individual ranchers, contractors, realtors), Consumers, HomeOwners / Home buyers, & Landowners? Our questions include allegations that are criminal in nature. For example, evidence suggesting:. As far as we know, our Public Officials have not take action regarding these criminal allegations as required per Title 18 U.S.C. Austinites Lobbying for Municipal Accountability (A.L.M.A.) asks these questions with the support and advocacy of The Gray Panthers of Austin (GP) and the Travis County Green Party (TCGP). its 'unsustainable' spending, says sunset panel. click:Why should those who've abused the public trust, & misused Federal Funds, be entrusted with Stimulus Funds? click: WHERE'S CITY OF AUSTIN ACCOUNTABILITY IN FEDERAL FUND USE? 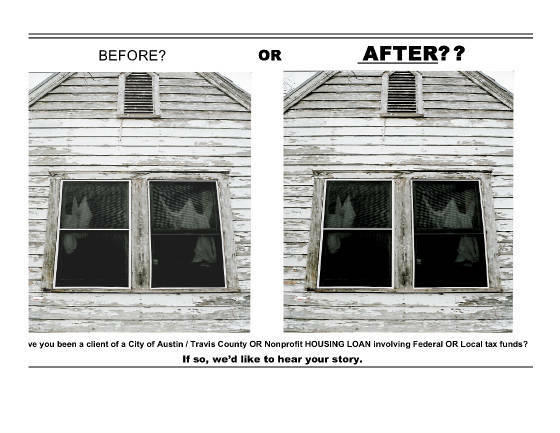 The Loan That Never Was: An Austin family's experience with the City of Austin's federally-funded home loan program. Questions about Cap Metro's cost overruns & accessibility questions have some wondering: Can Capitol Metro be entrusted with the Stimulus Funds? Austin Community leaders, such as Rudy Williams of Blackshear Neighborhood Assoc., Jim Harrington of TX Civil Rights Project, request public official accountability. How effective will Federal housing funds be applied if Austin Housing Authority can't account for millions and questions involving F.B.I. inquiries persist? GRAY PANTHERS OF TEXAS -- Age and Youth In Action! HomeOwners for Better Building (HOBB) and a number of other consumer advocacy and housing rights organizations raise parallel questions with regard to the Texas Homebuilder / 'Rehabilitation' Industry. Who is the Hand Count Coalition? VoteRescue; Gray Panthers of Austin; LULAC Dist. 12; Travis County Green Party; Texans for Accountable Government (TAG); Austinites Lobbying for Municipal Accountability (ALMA); Flouride Free Austin; Capitol City Cruisers; Progressive Hispanic Democrats, Instruments for Peace, and others to be announced. Why are people interested & how does this affect you? Nonresponsiveness and a lack of accountability from our representatives (elected and appointed) is a growing complaint amongst citizens and advocacy groups -- as evident in Travis County Commissioner Court testimony. Even evidence of mis/mal/nonfeasance, and fraud, waste and abuse on the part of some of our municipal officials, seems to fall on deaf ears. Does this violate Title 18 USC? How can We the People vote unresponsive officials out, if we cannot witness the counting of our votes; and therefore cannot be certain if they were indeed counted as cast? **NOTE: Written testimony and Actual Verbal Testimony do not always match. Therefore, the written testimony could potentially be misleading and alter the meaning.